There are many types and varieties of restaurants and eateries in Japan, from the highly expensive to the very cheap. Let us look at some of them, starting from the most expensive ones. Serving Kaiseki Ryori 懐石料理, maybe the most expensive, many are located in Kyoto and the other big towns. Often you need a special introduction to go there and NEVER ask for the price of the food! 和食　料理店 Washoku　Ryooriten, Restaurants serving only Japanese food. Many have a long tradition and their chefs take great pride in working at a famous place. 食堂 Shokudoo, shokudo, serving Japanese food, often near a station or an area where many people take lunch outside. Some can be quite cheap and are just a large living-room like space in the ground floor of a private home, run by a couple. often serving cheap Chinese food. Amimoto ryoori, 網本料理, food served from fresh catches of the day. Amimoto is the name for the local boss, who lends boats and equipment to the fishermen. Matagi ryoori, マタギ料理, the cuisine of the hunters, mostly wild boar and deer. Curry Rice Shops, karee raisuya カレーライス屋They are specialized for the Japanese version of the Indian Curry. Sometimes it is just a counter with 10 seats, run by a couple. Soup restaurants, raamenya ラーメン屋Some serve all kinds of soups, some only local ones an area. So you can have your favorite Nagasaki or Sapporo Ramen anywhere in Japan. Some are so expensive, you never check the price of any dish and just eat what the master serves you. Often the guests are regular patrons (Stammgast). Some are food chains and serve any dish for a small amount, like 100 yen or 150 yen. The one's with bands where the dishes roll around the counter, kurukuru sushi くるくる寿司 are of this type. You staple the small dishes at your side and a waiter counts them before writing the bill. Often you need the introduction of a friend to be admitted. Family restaurants, ファミリーレストラン, mostly restaurant chains all over Japan, like Denny's. Many are specialized on "Western Food" yooshoku 洋食, some have a free service of drinks. After 2010, family restaurants are less popular since families have to tighten the budgets. Fast food chain restaurants ファーストフード, like McDonald, Mister Donuts ミスタードーナツ or Starbucks. Lotteria to give refunds if customers do not like new hamburger "zetsumyo" for 360 Yen, July 2009.
like omuraisu, katsu cotelettes, hanbaagu hamburgers, ebifurai deep-fried shrimp, hayashi raisu hashee, rizotto rice and many more. gohan ご飯 in bowls is not served, but raisu ライス　on a plate, to be eaten with the fork. Some have a bit of tradition since the Meiji restauration and opening of Japan and owners in the fourth generation still keep the taste of their great-grandfathers. The first were around Yokohama when the port opened for foreigners after 1868. (lunch time, lunchtime is ranchi taimu ランチタイム). Izakaya, 居酒屋, public drinking house, the German KNEIPE, where workers take a sip before going home. Often located close to the station. Some are chain restaurants, others are just small establishments on the ground floor of a home, run by a couple. You get a free appetizer (otooshi in Kanto, tsukidashi in Kansai) before ordering. 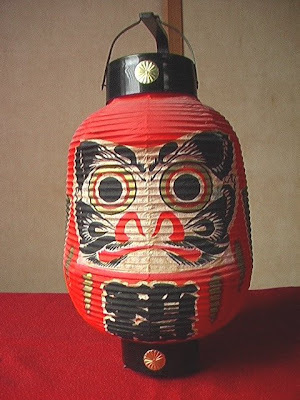 These are most often also called "Red lampions" aka choochin、赤提灯, because such an item is hung outside the restaurant. They serve healthy food, using naturally grown vegetables, chicken or natural fish from the area only. The owners are proud to contribute to environmental conservation of resources. In Kanto, owners are called TENCHO 店長, in Osaka, TAISHOO 大将. these are much-loved local establishments for casual drinking and dining. 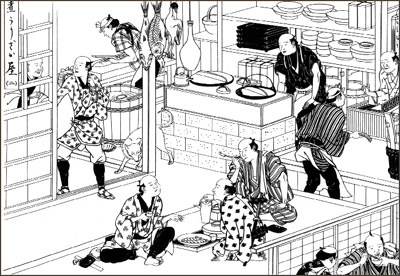 It is said that izakaya were started in the Edo Period (1603-1867) when sake was sold at large in individual servings. People would drink in front of the liquor shops, so eventually the shops began to serve simple foods to go with it. As matter of fact, you can still find some liquor shops that have places to sit and drink with simple finger food today. A new type of Izakaya, where all food costs only 270 Yen. Open since August 20, 2009. They want to become a nationwide chainstore. Izakaya More of my own PHOTOS ! Guests sit around an open fireplace and enjoy barbequed seafood, meat and vegetables. often shortened to just robata (ろばた in hiragana), refers to a method of cooking, similar to barbecue, in which items of food on skewers are slow-grilled over hot charcoal. Many Japanese restaurants, both in Japan and abroad, specialize in this style of food preparation. Traditionally, the food consists of a combination of morsels of seafood and vegetables, but other kinds of food that are suitable for grilling may also be offered. Robata originates from a centuries-old country style of cooking by northern Japanese fishermen around a communal hearth (irori) that serves both as a cooking area and a source of heat, found on the northernmost island of Japan, Hokkaido. Hotels and Ryokan, ホテル、旅館 also serve food, mostly of local and seasonal flavor. One speiality are the temples where you can stay over night and sample the "food of the monks", shojin ryori, shoojin ryoori 精進料理, vegetable dishes. You are also expected to take part in the morning prayer sessions and sometimes a bout of cleaning, gardening or oher temple work, samu 作務. These places are called shukubo, shukuboo 宿坊. Mt. Koya is especially famous for its shukubo and in the evening, after your meager meal, you can go to the center of the huge temple compound and sample a bit of the "water of wisdom", hannya no mizu 般若の水. At a ryokan, the O-Kami san おかみさん, O-Kami, is in charge of caring for the visitors and their entertainmens (motenashi 持て成し) while the husband or sun is handling the kitchen as itamae　板前, the chef.
. . . CLICK here for Photos of O-Kami san ! Yatai, 屋台 food stalls, pushcart stalls, used to be more common, are now under stricter hygienic control. They also were located close to train stations, even under the rails in the most noisy areas. In some towns we now have "food stall villages", yatai mura, where many are located together to share water supply and toilets. The most famous three ones were for Sushi, Tenpura and Soba noodles. The nihachi soba (80% buckwheat and 20% wheat) was mostly frequented. Yatai selling cheap food are also part of every festival, standing on both sides of the acces road to the festival ground. The modern version of the YATAI is a truck equipped like a small kitchen. Especially during festivals or during lunchtime in the cities they show up or bring pre-cooked food and sell it rather cheap to the visitors and office workers. They also used to come around local neighbourhoods to sell soup and other food in the evening, sounding as special song so you knew the "Ramen Car" was approaching. You bring your own bowl to get the noodle soup or grilled sweet potatoes.
. Tempura yatai (stall)　天ぷら屋台 . are stop-overs along national roads, where you can have a cheap meal of local specialities. They also have stores selling the local specialities and fresh vegetables of the area. Some are quite famous, for example the one in Okutsu Hot Spring, Okayama prefecture, where the local housewives prepare their home-made food and sell it for "all you can eat" for a rather cheap price. The variety of dishes and sweets is great and every day numbers of tourist buses flood the parking area during lunchtime. Chain food stores also sell o-bento and some provide a space where you can eat too. hokahoka bento　ほかほか弁当. . . CLICK here for Photos ! Some of them are open for 24 hours and quite frequented by the young office workers. 弁当, 駅弁, lunchboxes sold at the station. You can still find them on the road to a remote mountain temple. They serve tea and light refreshments of the area. They were quite common along the many official travelling roads (kaidoo　街道) leading to Edo (now Tokyo). Also called "Water Tea Shops", mizujaya 水茶屋 (みずぢゃや) or chamise 茶店(ちゃみせ). The "tea room with four and a half mats 四畳半" is a small one for the tea ceremony. Tokyo's glitzy Ginza district is becoming the new platform for satellite shops opened by various prefectures to introduce their local specialties and offer tourism information. Gunma and Tottori opened such shops last summer, and Yamagata will relocate its Tokyo outlet to Ginza this spring. A growing number of shoppers are flocking to such stores, boosting sales and drawing new local specialty shops to the district in Chuo Ward. On Nov. 21, when seasonal marine products from the Sea of Japan were put on sale at the Tottori outlet, middle-aged and elderly housewives rushed to snap them up. "There are many customers with 'matsuba' crabs on their minds, and they are sometimes sold out in one day," shop manager Hirotaka Toba said, referring to brisk sales of the famous but expensive winter delicacy. But even if the sales target is achieved, the monthly rent — about ¥3.5 million — is a big headache, and some ¥20 million a year is required from the prefecture's general account to cover the deficit. An official in charge said the red ink could be wiped out if local products that become popular at the shop are instead sold at department stores and supermarkets. According to the Japan Center for Regional Development, satellite shops in Ginza became widely known in 1994 after Okinawa opened an outlet. In 1995, Kagoshima opened a shop near Ginza in Yurakucho, and Hokkaido and Iwate followed suit. There are now about 15 prefectural satellite stores in the Ginza, Yurakucho and Shinbashi districts. Click on the photo to check some more menus. The menu chart is often with photos of the dishes (see above) , so it is easy to pick our favorite dish. Shochikubai are the three friends of winter in Chinese legend and lore. saikan sanyu 歳寒三友 "three friends of winter", especially well known during the New Year holidays, when products with their name are auspicious.
. Masaoka Shiki　正岡子規 . See you soon at the local IZAKAYA! The first Shunju -- the name means, simply, "Spring, Autumn" -- opened in 1986 in the trendy but well-off-the-mainstream Mishuku district. Its synthesis of cutting-edge looks (the creation of interior designer Takashi Sugimoto), its sophisticated but casual Japanese food and its stylish, late-night bar hit just the right note for the times. It has proved so popular and enduring that it has spawned five larger, more central sister operations and helped spark a movement that has spread through the city. As Iwatate explains in her foreword, the principles of this modern washoku are no different from those of the old -- the bounty of the mountains, oceans and rice paddies of this country, harvested in season and served as close as possible to their natural state. That means lightly cooked, indeed often raw, and, above all, presented with the artful simplicity that lies at the heart of Japanese culture. What propels the modern ryori, as espoused by Shunju, into the present tense, distinguishing it from anything that has come before, is the willingness to incorporate foodstuffs and cooking styles from other parts of the globe into traditional Japanese recipes. Lemongrass, avocado, cream cheese, herbes de Provence and spicy Korean kochujang chili paste: These are just a few of the many non-native ingredients embraced by Shunju and the new generation of Japanese chefs. The recipes in "Shunju" assume a familiarity with the fundamentals of Japanese cooking, and many are likely to prove too complex and time-consuming for all but the most adventurous and committed cooks. They also include ingredients that, even for readers in Japan, will be hard to come by, and suggestions for alternatives would have been appreciated. But the other reason why it is more likely to remain on the coffee table than in the kitchen is because it's just too beautiful to sully. "Shunju" is without doubt the most sumptuous book on Japanese food produced this year, and it arrives at just the right time for the Christmas gift-giving season. The menu is classic Shunju, but also introduces several new ideas for the first time. The starters are exquisite, inventive and tasty, with a more noticeable Vietnamese accent than before. The nama-harumaki spring rolls are filled with crab meat, cucumber, yama-imo yam, lettuce and slivers of apple (and no harusame vermicelli filler), and are served with a dip prepared from kani-miso (the innards of the crab shell) and nuoc mam fish sauce. Or try the banh xeo, crisp, golden pancakes filled with green mung bean sprouts, morsels of pork and tiny sakura ebi shrimp. You eat them with a lettuce leaf and spicy miso. Like many modern izakaya, Shunju makes delicious homemade tofu. Their on-dofu (hot tofu) is perfect for the winter season. It is prepared from scratch, using fresh soymilk heated up in small, individual do-nabe casseroles with a nigari coagulant. The taste is warm and savory, like a beany custard with the consistency of blancmange. They offer an excellent selection of charcoal-grilled foods, including king crab; various kinds of fish; tasty, juicy jidori chicken; and excellent vegetables -- especially the shimanita negi, a type of leek. But the main addition to the Shunju repertoire is their selection of Dutch-oven dishes. These heavy, cast-iron casseroles are perfect for slow cooking, sealing in the steam so the food cooks in its own juices. They have eight varieties, ranging from simple oysters steamed in ginjo sake to a delectable mixture of snapper and root vegetables cooked with thyme and other herbs in almost pot au feu style. all kinds of Chaya, not only selling tea . . .